Safaricom is on the spot for stealing from their subscribers who use the Mpesa service to buy airtime or data bundles for other subscribers, who have airtime debt popularly known as Okoa Jahazi. Several customers have come out to complain about it, though Safaricom defends itself on basis of ‘terms and conditions’. Whenever a customer buys airtime for another subscriber, who in this instance has Okoa Jahazi debt, he/she is deducted total amount inclusive of the debt. 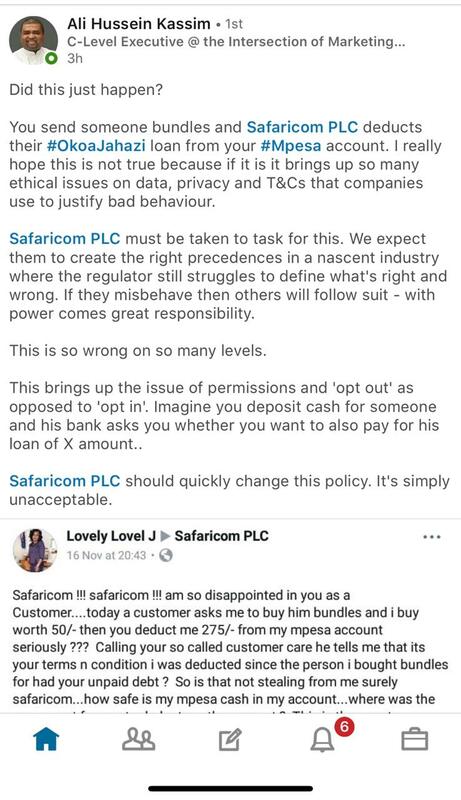 For instance, a Facebook user Lovely Lovel bought another customer data bundles worth Ksh50, but to her shock she was deducted Ksh275 from her Mpesa account. 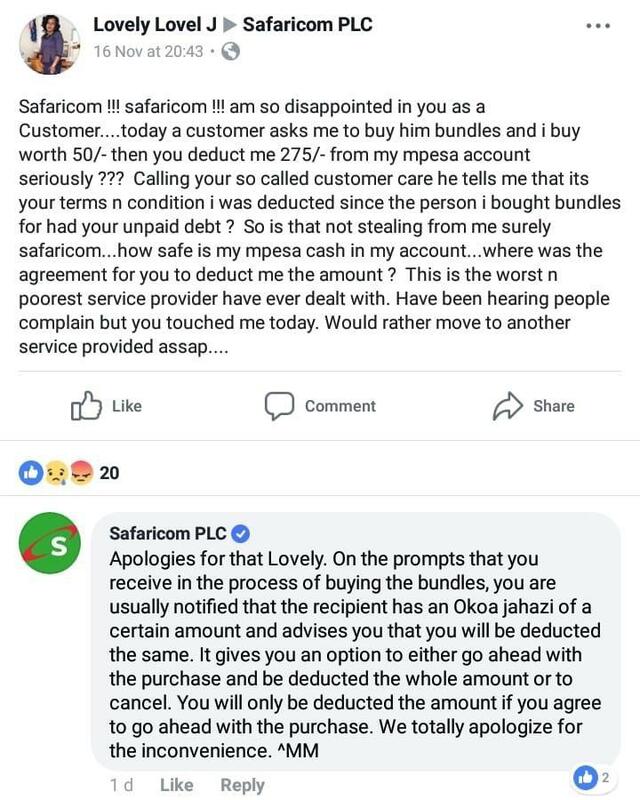 Upon inquiry, Safaricom’s customer care service tells her that the amount was deducted to pay for the other customer’s Okoa Jahazi debt, as part Of Safaricom’s Terms and Conditions. “Today a customer asks me to buy him bundles and I buy worth Ksh50 then you (Safaricom) deduct me Ksh275. Calling your so called customer care service he tells me that it is your terms and conditions I was deducted since the person I bought bundles for had your debt,” posts Lovel on the Safaricom Facebook page. In response, another user, Ali Hassan Kassim, responds by asking that the policy should be repealed. 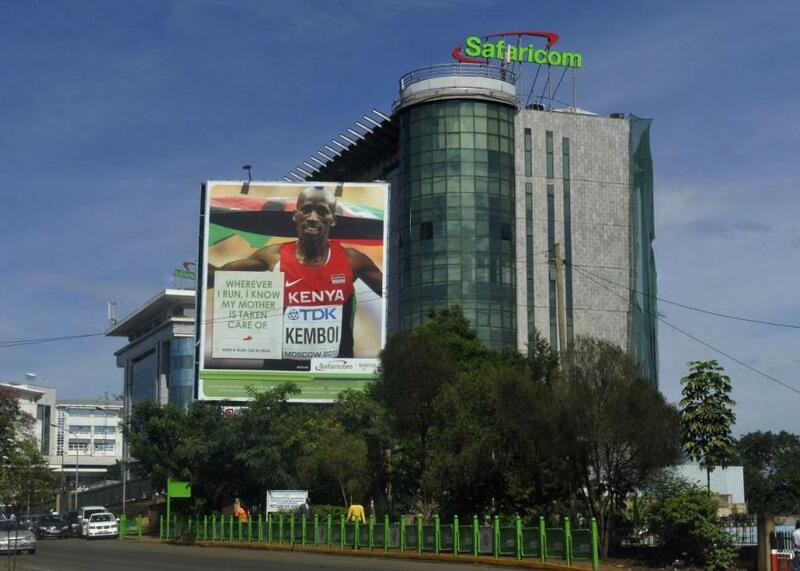 Safaricom must be taken to task for this. We expect them to create the right precedences in a nascent industry where the regulator still struggles to define what’s right and wrong. If they misbehave others will follow suit. This is so wrong on many levels,” says Kassim. Safaricom is yet to give an explanation for ‘extorting’ its customers, a part from giving the usual ‘terms and conditions’ narrative.